Last week I picked up I Love Trader Joe's Vegetarian Cook Book because the recipes looked great and each recipe had a vegan version. When I got home I spent some time with the book and decided to go for the Spaghetti and Meatballs Bake. However I did not pick up the vegan meatballs when I was in the store and made do with Tofurky Italian Sausage cut up into pieces. I tried the vegan mozzarella they started carrying for the first time, I have been hesitant to try it because besides Daiya, I really do not care for other cheese subs.I scaled the recipe down to a 8X8 baking dish from a 9X13 - as always I cook for two (with a bit for Mar thrown in of course!) not a family. With the pasta bake I made the garlic bread recipe featured in the new Everyday (with Rachele Ray) magazine, veganized of course. I used garlic powder instead of minced garlic because I had it on hand. This meal was a huge hit! Matt hates lasagna - I loved it growing up and missed it. Anything pasta-y is pure comfort food for me. 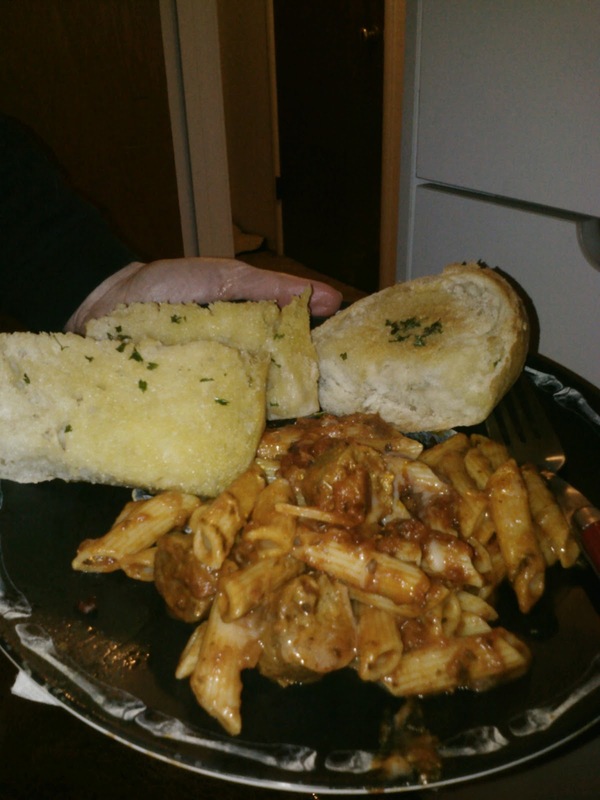 So when I asked Matt if he wanted seconds as I was going for mine he said "yes - it is so good"...Mar even dug it but then again that cat loves pasta and pizza - well anything Italian. Mar is a real Meow-rio Catali! This pasta bake is easy to put together and reminds of lasagna but is friendly to those that hate it. The garlic bread was super good too, buttery and warm! We never really had garlic bread growing up, I remember seeing the plastic wrapped loaves in the frozen section but I was spoiled with grandma's fresh baked bread or a loaf from the bakery. Garlic bread is good! The meal was around $12 for two people and a cat who love pasta, I used a fresh loaf of bread and the Tofurky - which made it under $10. Still budget friendly compared to going out to dinner.